“I’m going out at the top,” new Mayor of Melton, Councillor Pru Chandler, told the Melton Times as she prepared to start her final year on the borough council in the top civic role. Councillor Chandler has represented Bottesford on the authority since 2003 and she is the second member from the village to be Mayor in the last three years, following on from Councillor David Wright. She will be the first incumbent to be flying solo without a consort - her farmer husband Bob died 19 years ago and her son wasn’t interested in filling the role, she said shortly after being elected at Tuesday evening’s annual meeting. “I’ve really enjoyed being chairman of the planning committee during my time on the council and being Mayor is fulfilling the last of my ambitions,” she said. Councillor Chandler served on Bottesford Parish Council from 1988 to 2007, spending six years as chair. A grandmother of three, she enjoys playing indoor bowls and supporting Leicester Tigers RFC. Councillor Chandler said she would be aiming to raise the profile of the borough during her term in office and she is keen to liaise with Senior Townwarden John Southerington and Melton Town Estate on achieving this. Rainbows Hospice, which provides care and support for children and young people with life-limiting conditions and their families, and the Derbyshire, Leicestershire and Rutland Air Ambulance will be her chosen charities. Councillor Tom Greenow was elected as Deputy Mayor, with his wife Emma acting as Deputy Mayoress. Members re-elected Councillor Joe Orson as leader after he took over the role last year. 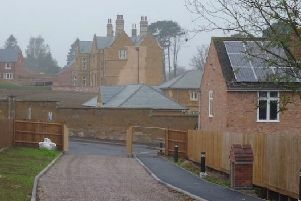 He told the meeting that a lot had been achieved in the past year with progress being made on the Melton Local Plan and the quest for a distributor relief road for the town, plus the re-evaluation of the council’s priorities following an independent review. “I believe we can look to the future with excitement and renewed confidence,” he told members. Councillor Leigh Higgins, ward representative for Somerby, was retained as deputy leader.